Charlie Stevens of Steven’s Hardware iv Greenfield purchased the Case IH Farmall 656 pedal tractor that came with a matching grain cart during an auction at the close of the Ag is Everyone’s Business seminar held Friday at the Patriot Center at Southern State Community College in Hillsboro. Both the tractor and cart were donated by Bane-Welker Equipment in Wilmington. 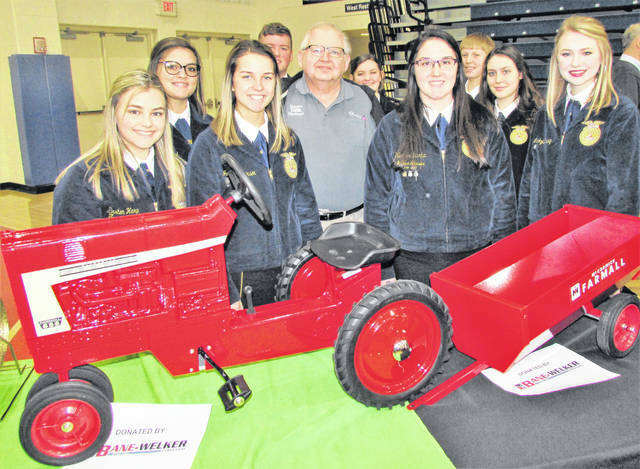 The high bid was $850, and Steven’s in turn donated the tractor and cart back to the Hillsboro FFA. Stevens is shown at center surrounded by FFA members whose chapters benefitted from the auction.